Our hotel in Triacastelas provided a breakfast, jamón y queso, banana, yogurt, tostada y café con leche. We had two of the last item and didn’t have to stop anywhere on the walk to Sarria. We were in town early enough to have dinner. Spaniards have their big meal between 2 and 4, the siesta, and we are usually still walking. Shops are closed during the siesta hours and restaurants stop serving at four and don’t open again until eight, way too late for us to eat. We asked the proprietor of our place in Sarria for a restaurant recommendation and he told us about two, one a Michelin starred place called “Roma” and the other, mas típico, “Pulpería Luis” on the river, a ways from the Camino. We chose the latter. 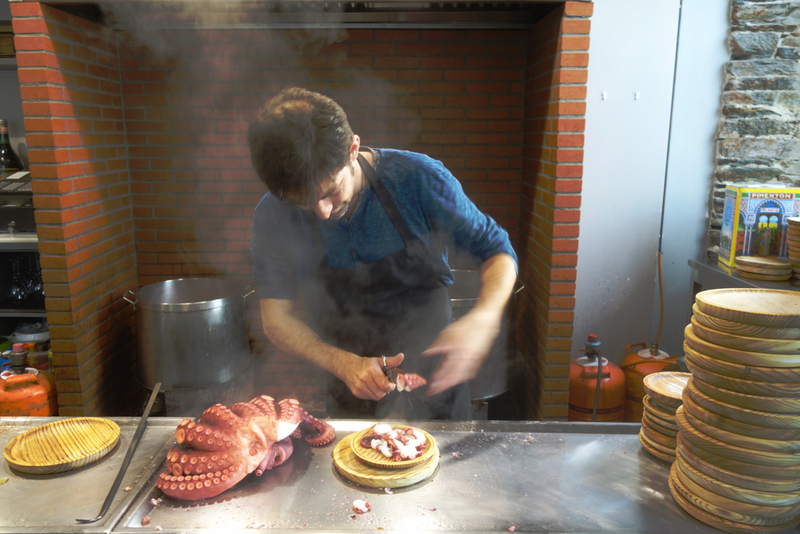 We watched this guy pull pulpo out of the boiling water with his bare hands, cut the tentacles with a pair of scissors and dress each serving with four magic ingredients, pimentón picante (hot paprika), pimentón dulce, salt and olive oil. There was a wait for a spot to sit down. The ten, family style, long tables and wooden benches were packed and the room was buzzing with lively conversation. This was the best pulpo we have ever had, as good as the best Italian sausage. House red and a bowl of artisan bread accompanied the soloist.